Thank You for a Great Upper Mill Creek Cleanup! A big THANK YOU to all the volunteers who came out to clean up Twin Creek Preserve. This reconstructed wetland helps moderate and filter the flow of water where the East Fork Mill Creek flows into the main stem Mill Creek. The Green Corps led teams clearing invasive honeysuckle and pear while the Mill Creek Yacht Club hauled trash out of the creek. 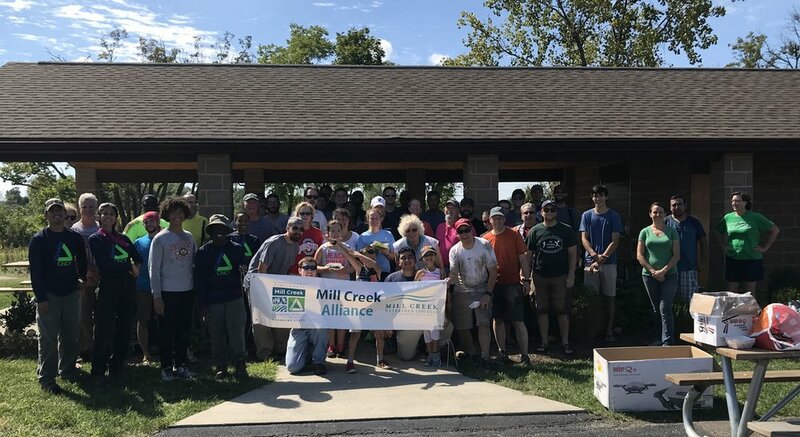 Thank you to our amazing partners, Smithfield Foods (who brought lunch and a team of volunteers, Rumpke, City of Sharonville, Springdale Public Works, Black & Veatch, Keep Cincinnati Beautiful, REI, Outdoor Adventure Clubs, Groundwork Richmond Virginia, and Groundwork USA. Be sure to keep in touch via our newsletter, facebook page, and website to see all upcoming events! You can see all the photos from the day here. In August, members of the Green Team traveled to Yellowstone National Park with Groundwork youth from across the country. Trips like this are possible because Mill Creek Alliance is a trust of Groundwork USA, in partnership with the National Park Service. While at the park, the youth had the opportunity to check out the incredible geothermal and geologic features, including Mammoth Hot Springs and The Grand Canyon of the Yellowstone. They saw elk, bison, and pikas. While there they completed projects to benefit the park, including constructing a new woodshed and bear boxes. Check out some photos from their incredible trip! During a very special evening at the Murie Ranch of the Teton Science Schools in Grand Teton National Park our very own Tanner Yess received the Murie Spirit of Conservation Award for his work developing the Groundwork Green Team and Green Corps programs and engaging communities in making the Mill Creek Watershed a better place to work, play and live. Here, he is pictured with Bert Raynes, who received the Murie Award this year for lifetime achievement. City Beat published an article about Tanner's award that you can read here. Members of the Green Team had an incredible trip to Grand Teton National Par last week. They joined Groundwork US, Groundwork Atlant, and Groundwork New Orleans for eight nights of camping at the Gros Ventre campground. 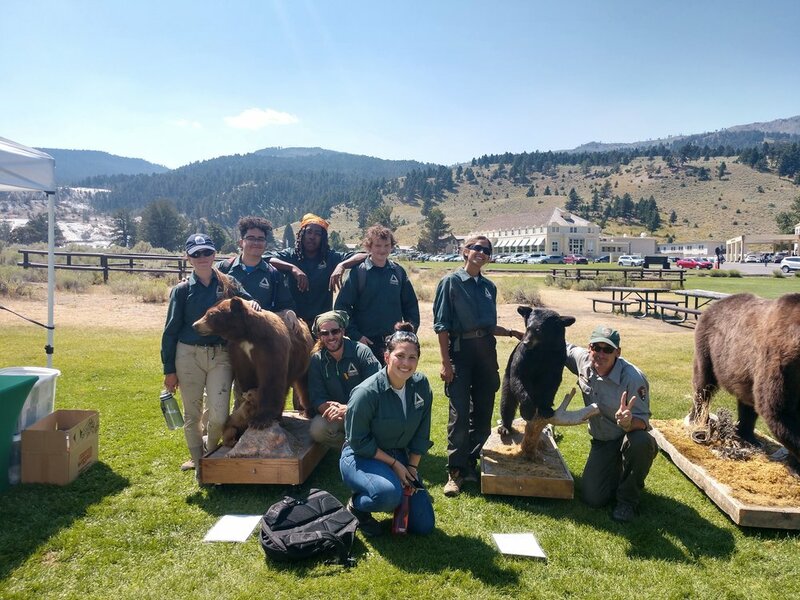 After flying into the park on a Thursday (the first time on an airplane for many green teamers), the group spent some time setting up camp and getting oriented to the park, which included a discussion of bear safety. The air was dry and the nights were cold in the high desert of Jackson Hole, but they acclimated quickly. The next day they toured the Murie Ranch Historic Distric with Docent Dan, who explained the history of the park, and this incredible couple who helped establish Grand Teton National Park, the Wilderness Act, and protect numerous wild areas. (Next week, Groundwork Cincinnati-Mill Cree deputy director, Tanner Yes, will be receiving the Murie Award at this same site.) They ate lunch overlooking the National Elk Refuge and learned about the migration of these creatures who at one time came close to being extirpated from this area. They visited the National Museum of Wildlife Ar and learned the impact that art has had on preservation and conservation. Saturday included a boat ride across Jenny Lake and a scenic and challenging hike into Cascade Canyon. The group was accompanied by a park ranger, who helped spot pikas, marmots, a bear cub, and a moose, and identify other local flora and fauna. Many enjoyed bouldering, snacking on wild huckleberries, and the dramatic views of Grand Teton mountain. Sunday the group traveled north to Yellowstone National Park, where they toured the prominent hydrothermal and geologic features such as Grand Prismatic Spring, The Grand Canyon of the Yellowstone, and Old Faithful. They even got to see a larger geyser, Beehive, go off. Monday was the first day of work with Grand Teton National Park Rangers. The group worked in the Laurance S. Rockefeller Preserv installing new bike racks and trail brushing (clearing trail). Tuesday the group worked to complete the approximately 1.5-miles of trail brushing and spent their lunch by beautiful Phelps Lake, where gregarious chipmunks tried to steal their lunches. Wednesday they hiked up to spectacular Inspiration Point and worked with the Grand Teton National Park trail crew to haul rocks and soil for new trail infrastructure. The trail crew lead estimated that the group moved 30,000 pounds of rock and 15,000 pounds of soil, and helped them complete a weeks' worth of work in one day! Everyone embraced the challenge wholeheartedly and worked together to accomplish an impressive amount of work. Thursday they finished up work at the Preserve and worked on building new picnic tables. They said farewell to the rangers, then their week concluded with a ceremony recognizing their hard work and camaraderie. The green teamers enjoyed new foods (eggplant, huckleberries), new activities (camping, using power tools), and new sights (mountains, moose). They enjoyed shopping in downtown Jackson Hole, spending time with new friends, and the learning a traditional native handgame from the Montana Conservation Corp, who were camping next door. Many Green Teamers expressed a desire to bring their families to the park, demonstrating how meaningful this experience was for them. Check out an album of photos from this incredible trip here. While we work on our New MILL CREEK ALLIANCE News Blog, click below to be redirected to our previous websites.